We've all got that one person who they find it impossible to buy for at Christmas, for me that person is my Dad. Every year I ask him what he'd like, and every year he tells me I don't have to give him anything. At a push he relents and tells me not to spend a lot, but if I want I can buy him a gift voucher. Which, quite frankly, is a pain. Because of all the people I (willingly) buy gifts for my Dad is the one I want to find something really special for. We don't spend a lot of time together, and when we do meet up we don't always say a lot, but I know he's there for me and I hope he knows how important he is to me. And while I know you don't need a glitzy present to tell a person you care, it's nice to be able to give something to say thank you and show them they're special. Something that shows you took the time to think about them and consider what they might like. Unfortunately, when it comes to gifts for my Dad no amount of thought helps me to achieve such a present and this year was looking highly likely to be another exercise in gift voucher-buying. Then I discovered The Aviation Bookshop in Tunbridge Wells. Just a stone's throw from the historic Pantiles area of the town, this thriving specialist bookshop felt like the answer to all my present-buying concerns. Because despite ending his career (very successfully) behind a desk, the early days of my Dad's working life were as an apprentice at A V Roe. While I confess I don't know the details of his plane building apprenticeship, one of the things I do know is that my Dad worked on the last remaining Vulcan to grace our skies. A fact I was particularly proud to share with all my Kent friends when it took part in an airshow in the county this summer. And so I set off to The Aviation Bookshop to find a meaningful Christmas present for my Dad. Being fairly (totally) ignorant of the aviation world I'd anticipated a small shop with a few easy to spot books about the Vulcan. I'd walk in, talk to the bookseller and choose a gift. In reality it is a large shop, spanning several rooms filled with shelves of carefully arranged books. Thankfully the second part of my plan - the bit involving help from a bookseller - saved me from disaster. I mentioned the Vulcan and immediately a selection of new and old books were collected from the shelves, including a few that were signed. We talked about planes, Avro (as I now know my Dad's former employer is known) and eventually I selected a fairly new book with some lovely colour photographs that even this ignoramus could appreciate. 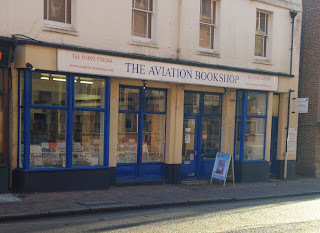 With a little gentle prodding the bookseller then told me about the history of the shop, book signings and the service it provides to aviation fans all over the country so that I soon became fascinated - I'd love to one day bring my Dad along so I can see a proper enthusiast enjoy the setting.